Are you ready to meet The Thing? 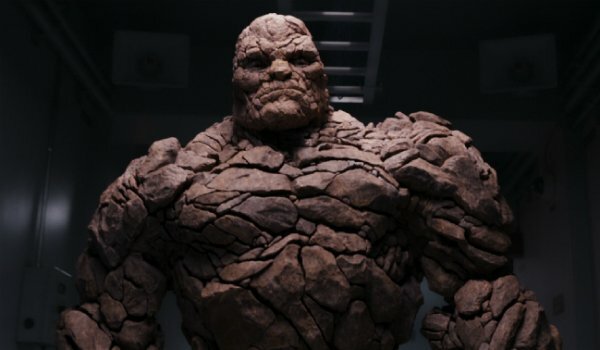 The hulking Ben Grimm in Josh Trank's Fantastic Four reboot has remarkably kept himself in the shadows. It's difficult to keep something like a giant rock monster away from the public spotlight. But now 20th Century Fox has unleashed the beast in a brand new photo from the movie. Jamie Bell, are you in there? It's hard to think of someone as slim and trim as the star of Turn voicing a superhero of this magnitude, but here he is, nonetheless. At least he looks far better than Michael Chiklis' run, right? Empire magazine was the first to reveal this image, which does not look like like a rubberized suit. We've only seen bits and pieces of the new Thing in the trailers -- we saw him break forth from his stone coccoon and we got a good look at his backside -- but this is our first, non-leaked image. Now that we know what all four of these heroes will look like, "It's cloberin' time!" Trank utilized motion-capture technology to bring The Thing to life, with Bell donning the spandex tracking suit covered in markers to record his movement. The technology has come a long way since the days of Avatar, and the more it progesses, the more filmmakers want to use it. Andy Serkis is the master of motion-capture, and he has created a whole new genre of acting with it. He recently worked with Joss Whedon to help bring The Hulk in Avengers 2 to life, while Ultron and Thanos (played by James Spader and Josh Brolin, respectively) used motion-capture for their characters. The Thing is just the latest in a long line of creature features. This is just one example of how the new Fantastic Four distinguishes itself from the original. Trank seems committed to creating a sci-fi movie within a superhero movie, as opposed to a standard adaptation. 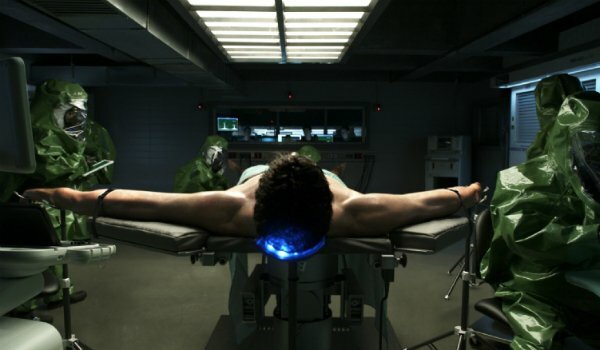 The plot takes some inspirations from the Ultimate Fantastic Four comic book series. 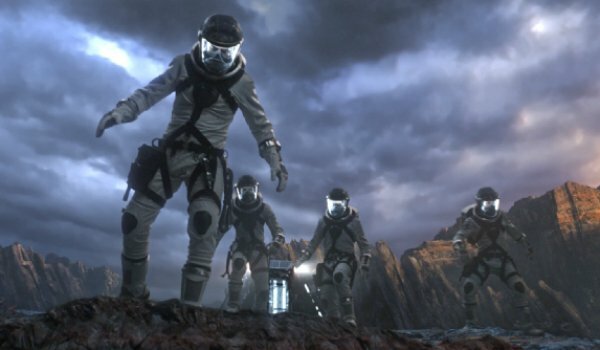 Instead of Reed Richards (Miles Teller), Sue Storm (Kate Mara), Johnny Storm (Michael B. Jordan) and Ben Grimm shooting off into space and gaining their powers through cosmic radiation, the younger versions of these characters will instead travel to a parallel dimension that alters their molecular structures. In addition to the new look at The Thing, Empire also released a couple more photos from the film, teasing this storyline. Here, we can see them traversing new territory with a device. Below, we see Richards getting experimented on. He doesn't look to be in his happy place.